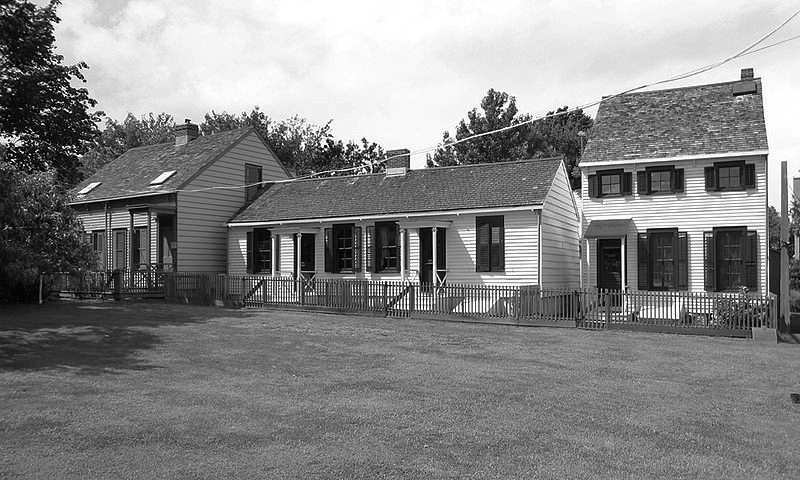 The Hunterfly Road Houses, dating from 1840-1880, are important historical remnants of a vibrant African American community in Weeksville during that time period. The Hunterfly Road Houses were originally discovered by Pratt Institute professor James Hurley and pilot Joseph Haynes while doing an aerial survey over the Bedford-Stuyvesant area for a neighborhood workshop in 1968.1 These wood frame, vernacular style houses dating from 1840-1880 are among the few vestiges of a once thriving independent African American community. The oldest house, dating from the 1840s, at 1702-4 Bergen Street is a one-story duplex with a central chimney.2 The second house at 1698 Bergen Street is a two-story hall and parlor planned house with a wooden shingle exterior, and dates from the 1850s.3 The third house at 1700 Bergen Street was built in 1883 according to records from the Brooklyn Buildings Department, and is a two-story house with a hall and parlor floor plan.4 The fourth house at 1706-8 Bergen Street dates from 1865, but was demolished by a fire in the early 1990s.5 A new structure was built in its place in 1993. These four houses serve as a portal to 19th century life in Weeksville. The town was founded by James Weeks, a former slave from Virginia, when he bought the property from another free black, Henry C. Thompson, in 1838.6 Weeksville quickly grew as a financially self-sufficient urban area of successful African Americans. The town was unique in that it reported the highest number of black owned properties and businesses. It also had the second “colored” school in Brooklyn, formed in the 1840s.7 During the Draft Riots, Weeksville became a safe haven for African Americans fleeing Manhattan. Weeksville was the home of many noted black intellectuals including Junius C. Morel, minister and principal of Colored School No. 2, and Dr. Susan Smith McKinney-Steward, the first female African American doctor.8 Public School 83, formerly Colored School No. 2, was also the first integrated school in Brooklyn in 1893 with integrated teaching staff.9 Weeksville even had its own newspaper, the Freedman’s Torchlight, which was among one of the first African American newspapers in the United States.10 The town continued to thrive into the early part of the 20th Century. However, by the mid-20th century, the area suffered from an economic decline due to urban renewal projects and white flight from the City. By the 1960s, few if any indicators were left of this cultural and economic epicenter for free blacks. After the houses were rediscovered in 1968, the community quickly worked to get the houses designated as landmarks by the New York City Landmarks Preservation Commission. Over the course of several decades, the houses were fully restored and now serve as a museum, illustrating to the community and its visitors its unique, hidden history. In 1969, Joan Maynard created the Society for the Preservation of Weeksville and Bedford Stuyvesant History in order to catalog the rich history of Weeksville's past, restore the Hunterfly Road Houses, and convert them into an African American history museum. On July 21, 1970, 1698 Bergen Street was designated as a New York City Landmark. On June 23, 1970, three more houses followed it as designated New York City Landmarks: 1700 Bergen Street, 1702-04 Bergen Street, and 1706-08 Bergen Street. These houses were also listed on the National Register of Historic Places in 1971. Currently, three of the four houses now serve as an interactive African American history museum. A fire destroyed the fourth house in the 1990s. A new building was constructed in 1993 to replace the 1865 house. It now serves as the offices and research center for the Weeksville Heritage Society. In 1969, Joan Maynard created the Society for the Preservation of Weeksville and Bedford Stuyvesant History in order to catalog the rich history of Weeksville's past, restore the Hunterfly Road Houses, and convert them into an African American history museum.15 Maynard launched a series of campaigns inspiring school children, community members, and activists to join the effort to preserve Weeksville's past. Community members in addition to students of P.S. 243 petitioned at a New York City Landmarks Preservation Commission public hearing to designate the buildings as landmarks.16 In 1970, the four houses were individually listed as New York City Landmarks, further protecting the houses from urban renewal. However, the Society for the Preservation of Weeksville and Bedford Stuyvesant History lacked the financial resources to restore the buildings, which had suffered greatly due to nearly two decades of vacancy and vandalism.17 The society was able to obtain federal funding and local funding from preservation societies including the New York Landmarks Conservancy. The real backbone of these grassroots efforts was the local community. The children of Public School 243 (later renamed the Weeksville School) started the campaign Pennies for Weeksville, while the neighborhood raised funds by having bake sales and a history fair.18 The act of rediscovering Weeksville in many ways served to bind the community as they uncovered the roots of their rich past. Eventually, the community was able to raise enough funds to fully rehabilitate the houses. In 2001, Pamela Green took over as executive administrator of the Society for the Preservation of Weeksville and Bedford Stuyvesant History. The organization then changed its name to the Weeksville Heritage Society.19 In 2005, the houses opened as an interactive museum, showcasing the many significant periods of the once prosperous, independent African American community. Houses on Hunterfly Road, 1698 Bergen Street. New York City Landmark Designation Report, 21 July 1970. Houses on Hunterfly Road, 1700 Bergen Street. New York City Landmark Designation Report, 23 June 1970. Joan Maynard, Weeksville Then and Now: A Search to Discover the Efforts to Preserve Memories of Self in Brooklyn, NY (Brooklyn: Society for the Preservation of Weeksville and Bedford-Stuyvesant History, 1983). Rae Banks, “Weeksville-Microcosm in Black.” Freedomways Vol. 12, No.4, 1972. Cassandra Zenz, “Weeksville, New York (1838– ),” BlackPast.orgTM: Remembered & Reclaimed. Article retrieved 15 April 2016. Kevin Plumberg, “Let’s Make a Landmark – Bed-Stuy’s Weeksville Becomes a Tourist Attraction,” Brooklyn Rail, 1 October 2003. Joan Maynard, “Weeksville Revisited,” In An Introduction to the Black Contribution to the Development of Brooklyn. (Brooklyn: The New Muse Community Museum of Brooklyn, 1977), page 87. Douglas Martin, “Joan Maynard Dies at 77; Preserved a Black Settlement,” The New York Times, 24 January 2006. Douglas Martin, “About New York; In History, Reconstruction Is Also a Struggle,” The New York Times, 9 February 1991.